Read the original words of more than 1,500 authors who made and analyzed American history through their speeches, writings, memoirs, poems, and interviews. 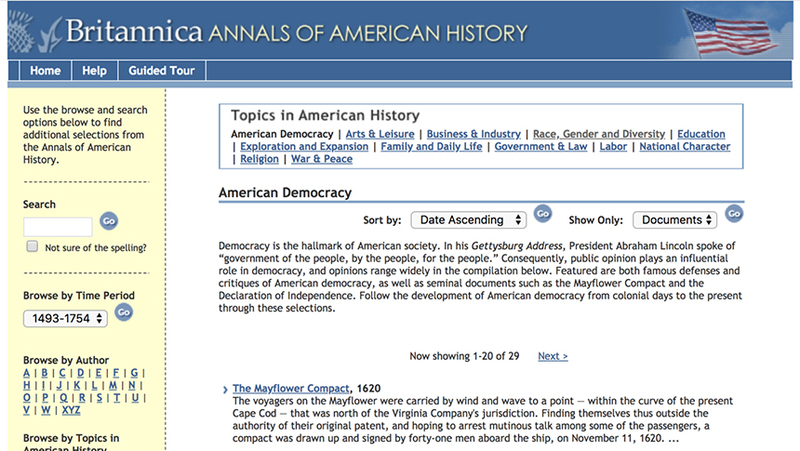 Learn more about Annals of American History! Coverage dates back from the Discovery of the New World by Christopher Columbus to the inaugural address of Barack Obama. Read A Day on the Oregon Trail, the Diary of a Confederate Spy, and the Camp David Accords. Users can read the original words of luminaries who have made history, including Madeleine Albright, Henry Ford, John Hancock, Malcolm X, and Frank Lloyd Wright. Multimedia transports today’s students back in time to hear Franklin D. Roosevelt giving his first inaugural address and John F. Kennedy discussing Soviet missiles in Cuba.